It’s a Saturday morning after a hectic week of classes. I barely caught a wink of sleep last night and I didn’t have any coffee. I wouldn’t blame anybody in my situation who was inclined to go to bed. However, I find myself in a lecture hall at UBC’s Hugh Dempster Pavilion with a fully charged laptop in hand, watching a teacher give a slideshow presentation. You see, it’s September 26 —National Learn to Code Day — an initiative led by the non-profit Ladies Learning Code. Today, in setups just like mine, over a thousand women across Canada have mobilized to learn Python — a programming language. We start our first project with the ubiquitous, “Hello world,” program which teaches users how to input text in a programming language. With promises of pizza for lunch, 120 other women and myself eagerly dove into the world of Python. It’s a fail-safe environment for beginner programmers where coding resources and patience are abound. The 4:1 ratio of learners to mentors means that help from an experienced volunteer is readily available. Frankly, the idea of programming can be a daunting one. Technology nowadays is so advanced that manipulating computer programs can seem like a Herculean task. However, at National Learn to Code Day, an accessible approach is highlighted. 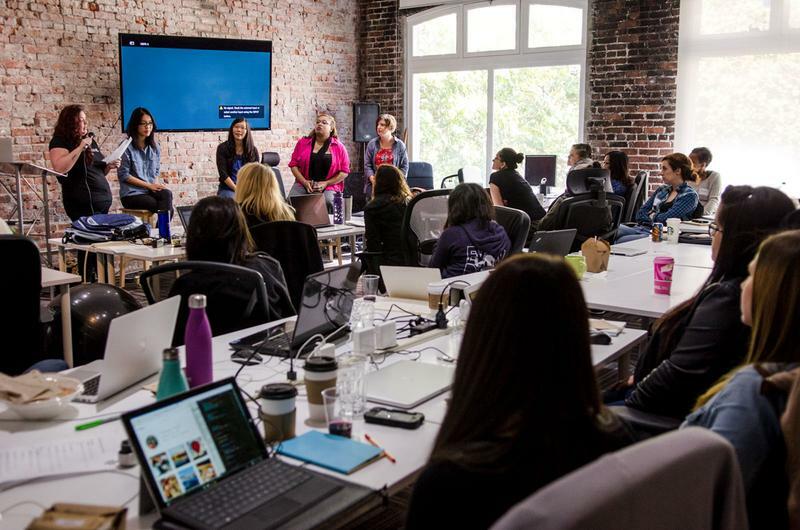 “[It is] a friendly and inclusive way for people who are non-technical to learn code,” said Zabrina Ting, Operations Lead of Ladies Learning Code’s Vancouver chapter. Women are prominently missing from the field of computer science in both academic programs and the workforce. The statistics speak for themselves — For at least the last 15 years, female enrolment in computer science programs at UBC has hovered at around 25 per cent. This is despite the fact that currently 54.4 per cent of our school’s enrolled students are female. Luckily, a slew of initiatives have sprung up in recent years to try and combat the lack of diversity in the computer science field. They engage girls and women directly through workshops and social events. Through making space for interested individuals to pursue coding, these organizations are equally as much about empowerment as they are about learning to code. The presence of fellow female (or minority) computer scientists, both as peers and role models, is integral in motivating other women to take up coding. Coding is a highly useful skill in our digital world — it’s even being implemented into some school curriculums. Whether you’re a computer science student, an entrepreneur, a blogger or a hobbyist, there are plenty of inclusive initiatives that provide everybody with the opportunity to sharpen their coding skills. Ladies Learning Code hosts both adult programming and youth-targeted camps namely Kids Learning Code and Girls Learning Code. UBC’s FoWCS also hosts GIRLsmarts4tech workshops for tweens and the Pacific Northwest Celebration of Women in Computing Conference. Plus, there are huge numbers of programming tutorials available to for free online for those who are just curious.